Kathleen’s Kitchen has become such a fixture in Sherman that it is easy to forget the restaurant hasn’t been serving strawberry salad and potato soup forever. Actually, it has been fifteen years since Kathleen Tuggle and her family opened the popular restaurant on North Travis Street. It is the kind of place that grew because Kathleen’s customers wanted it to grow. “Demanded” might be more descriptive. They just couldn’t get enough of the things she made. Cooking for family and friends was something Kathleen always considered fun and rewarding. “I would bake a few loaves of my own sourdough bread recipe—it has a slightly sweet flavor— and deliver them to friends to enjoy,” she said. “People encouraged me to keep baking, and I branched out to cakes, pies, cookies and all sorts of sweet things to eat.” Before long, she was creating gift baskets for friends, who used them as business gifts. Becky Brown, a friend, then a supporter, joined the operation and has been Kathleen’s right hand ever since. Her gift baskets became a hit, and soon Kathleen was going door-to-door, selling her idea of how to say “thanks” with something good to eat. Her baskets reached beyond a few treats for a few people; they were a business gift that an entire office staff could share. Her business was so successful that she decided she needed to move out of her home and into a bigger kitchen. 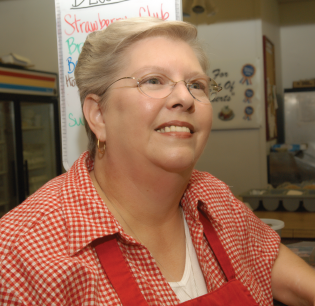 Kathleen moved to her now familiar location on North Travis in the summer of 1986, opened a bakery/deli to sell her baked goods, and started a signature line of sandwiches and other lunch items for take-out. “My customers kept saying that I needed to expand and have a place where they could sit down and enjoy a casual lunch,” she said. The customers got what they wanted in 1997, when Kathleen’s Kitchen added a dining room. It was an instant hit, and the place has only gotten busier over the years. With twenty employees and a full-fledged commercial kitchen, Kathleen watches over the entire operation, making sure every item that goes out meets her strict requirements for taste and presentation. “When regular customers bring friends in for the first time and recommend one of our signature items, they expect it to taste every bit as wonderful as the last time they ate it. Consistency is critical to establishing a restaurant that’s going to grow and stay popular,” said Kathleen. Kathleen’s Kitchen is a family operation. Her husband, Grover, just call him Tug, does the books, handles purchasing, fixes what breaks and makes deliveries. Daughters Heather and Becca pitch in and do whatever is necessary to keep things running smoothly. Standing over a big commercial range, stirring a pan of thick praline sauce, Kathleen looks up and smiles broadly. “You have no idea how much I love to be in this kitchen. I get tired, but I don’t get tired of cooking, if you know what I mean. – Butter (or use non-stick spray) an 8-inch spring form pan. In a medium sized bowl combine all crust ingredients. Press the mixture onto the bottom of the prepared spring form pan. Cover and refrigerate while you make the cheesecake filling. Beat the cream cheese until smooth. Gradually add the sugar mixture and beat until creamy. Add eggs one at a time, beating well after each addition. Scrape down the sides of the bowl and add vanilla and pumpkin. Pour the filling into crust and place the spring form pan on a baking sheet to catch any drips. 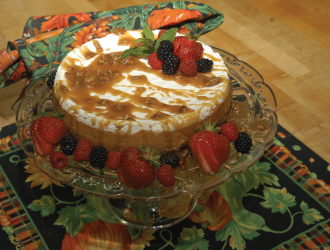 Bake the cheesecake for 30 minutes and then reduce the oven temperature to 325˚. Continue to bake for another 10-20 minutes, or until the edges of the cheesecake are puffed, but the center is still wet and jiggles when you gently shake the pan. Mix sour cream, vanilla and sugar. Pour the sour cream mixture over the top of the baked cheesecake. Return the cheesecake to the oven and bake about 8 minutes to set the topping. Remove from oven and place on wire rack to cool. When completely cooled, cover and refrigerate at least 8 hours, preferably overnight, before serving. Combine first 3 ingredients in a small saucepan over medium heat. Bring to boil; cook, stirring constantly for 1 minute. Remove from heat; stir in pecans and vanilla. Cool slightly; serve warm. Yield: 2 cups. Kathleen Tuggle owns and operates Kathleen’s Kitchen. The restaurant and bakery is located in Sherman at 1913 N. Travis Street, just north of Taylor Street. The restaurant is open Mon-Fri 11 a.m.-2 p.m.; the bakery is open Mon-Fri 7 a.m.-5 p.m. and on Saturday 9am-2pm. Kathleen’s Kitchen serves lunch, has take-out and does catering. Gift baskets for business or personal giving are available in a range or prices.